Compatible TN450 Toner Cartridge Black 2 Pack Print high-quality documents photos and graphics. The rich black ink gives your documents a crisp clear professional look. This cartridge can yield up to 2600 Each before needing to be replaced and installation is fast and easy. 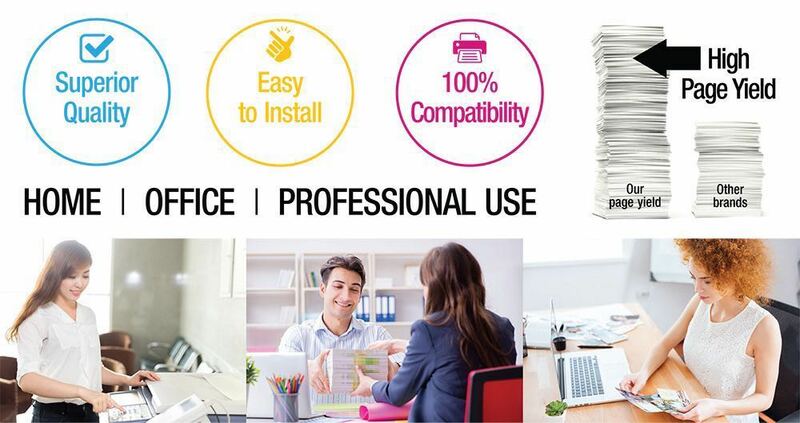 Compatible with: DCP-7060D DCP-7065DN IntelliFax-2840 IntelliFAX-2940 HL-2220 HL-2230 HL-2240 HL-2240D HL-2270DW HL-2275DW HL-2280DW MFC-7240 MFC-7360N MFC-7365DN MFC-7460DN MFC-7860DW etc. Thanks to my friend extensive research and development this toner cartridge produces a deep dark black for easy readability and clear graphics. Print professional-looking reports charts and other documents with its rich black ink. This Compatible toner cartridge is easy to install in your machine so you can spend your time doing more important tasks. Since it yields up to 2600 Each before needing to be replaced this toner cartridge allows you to do multiple projects without having to worry about running out of ink. The Brother TN450 Toner Cartridge Black 2 Pack is compatible with multiple Brother all-in-one machines Brother fax machines and Brother laser printers. Works wonderfully in my Brother printer. Great buys for printer toner cartridges. Highly recommended to everyone!! These toner cartridges seem to function as well as Original Brother Toner cartridges. No way telling how many copies you get at this point but the price was great. These are great toner cartridges. I don't know how they can sell these so cheap but it produces a clean and nice dark color and I would buy it again. These replacement Toner cartridges are works fine with my printer and I would recommend these as a legitimate replacement for the over priced original. Worked well in my Brother printer. Well packed inexpensive. I make a lot of copies cause I'm a novelist and always having people read my work. Horrible quality the copies are all black and barely readable. I have tried so many compatible cartridges for Brother. I had problems with them but it's working perfectly . The printer is used in a Homeowners Association for office copies. This product worked the first time I put it in the printer and the print quality is fantastic. No complaints yet.